I regret to inform you that AC Grayling is at again. LSE's Brexit blog has published a piece by Grayling with the title, "The EU referendum was gerrymandered". This piece is an excerpt from Grayling's book, Democracy and Its Crisis. It misrepresents the facts in relation to referendums, the Supreme Court's ruling in Miller, and what the House of Commons Library wrote in its briefing papers. Because the argument is so bad, I started to fisk it. I very much regret the time I have spent doing so, but I post it here in case it is of use. The Brexit referendum is an example of how the constitutional and political order of the UK is in a highly questionable state. This part I agree with. In my view, the Miller decision — which concerned the question of who could trigger Article 50 following the referendum vote — revealed some of the problems with our uncodified constitution. The Supreme Court ruled that it would be unconstitutional for the government to trigger Article 50 without involving Parliament. But some people expected the government to do just that on the day after the referendum. The government might have been poised to do something unconstitutional without anyone being any the wiser. Oops. Without over-exaggerating, it is arguable that the EU referendum itself and the government’s subsequent actions resemble something like a coup — a strong claim; but allow the following details to speak for themselves. Many things are, of course, arguable. What we want to know is whether the referendum and the government's subsequent actions do in fact resemble a coup. In my view, they do not, and the suggestion that they do exaggerates wildly. The fact that Grayling needs to introduce his remarks in this way ("Without over-exaggerating") suggests he is at least alive to the possibility. Which is nice. The referendum franchise excluded — after discussion of the matter prior to introduction of the EU Referendum Bill in Parliament — 16- and 17-year-olds, expatriate British citizens who had lived abroad for more than a certain number of years, and EU citizens resident in the UK and paying their taxes there. Grayling is correct in that none of these groups could vote in the election (with the exception of citizens of Ireland, Malta and Cyprus, who were EU citizens at the same time as citizens of Commonwealth countries (Malta, Cyprus) or countries whose citizens are for other reasons granted the franchise in UK elections (Ireland)). What is potentially misleading is the use of the term excluded. It might imply that these people would have had the franchise but for something that Parliament did. In fact, the government and Parliament — with minor exceptions regarding Gibraltar and peers — used the same franchise that had just recently been used for elections to Westminster. This was the same franchise that had been used in the referendum of 1975, and in the referendum on the Alternative Vote in 2011. It involved the use of an up to date register. Remain supporters supported the decision to use this franchise. Phillip Hammond (who supported Remain) argued that "the appropriate franchise for a United Kingdom question — a question about the future of the whole country — is the Westminster franchise". Hilary Benn (who supported Remain) agreed with him. He conceded that "[o]n the franchise, the Government are right to use the same basic approach as 40 years ago in the last European referendum and as 33 days ago in the general election — in other words, the parliamentary voting register". Parliament could have done differently. A number of MPs moved an amendment to include EU nationals. But this amendment was voted down by a large majority (494–64, with 53 SNP MPs voting for), which (necessarily) included a large number of MPs who supported Remain. It would seem obvious that all three groups should have been included as having the most material interest in the outcome of the vote. Grayling is implicitly invoking the principle that "all affected interests" should be enfranchised. Many political philosophers have discussed this principle as part of the "democratic boundary problem". The principle is appealing on the face of it, and may seem obvious, but it conflicts with other appealing principles (such as the principle that only citizens of a country should make decisions regarding that country as a collective), and very few countries practice it. As Sionaidh Douglas-Scott has noted, "EU member states did not generally permit other EU nationals to vote in their national elections, nor did they usually allow other EU citizens a vote in national referendums". The UK and Portugal are the only two countries to allow (some) foreign nationals to vote in their national elections [See note 1]. No threshold was specified for the outcome of the referendum, unlike the 1979 Scottish devolution referendum which required that 40% of the entire electorate should be in favour for any change to take place. The relevance of this is not clear. Although the 1979 devolution referendum required a threshold, this is the only one out of eleven UK referendums which has required a threshold. As we'll see later on, Grayling is either misinformed about the details of threshold requirements, or has omitted these details to help his case. In Briefing Paper 07212 published on 3 June 2015 all MPs and members of the House of Lords were told that the referendum was advisory only, and would not be binding on Parliament or government. This point was iterated viva voce by the Minister for Europe in the debate in the House of Commons later that month. This was the reason given for not including a threshold and for not extending the franchise appropriately (emphasis added). The briefing paper does state that "It [the Bill] does not contain any requirement for the UK Government to implement the results of the referendum, nor set a time limit by which a vote to leave the EU should be implemented. Instead, this is a type of referendum known as pre-legislative or consultative, which enables the electorate to voice an opinion which then influences the Government in its policy decisions". But this was not the reason for the absence of a threshold or the absence of changes in the franchise. The debates around the franchise largely concerned the general merits of enfranchising 16 and 17 year olds, rather than the franchise insofar as it related to the binding character of the referendum. The outcome was that 37% of the restricted electorate given the franchise for the referendum voted to leave the EU. This outcome is by any standards insufficient to justify a constitutional change so significant as the UK’s exiting the EU. There is scarcely any civilised state in the world where a simple majority, let alone a small one, would permit this: for such a change, a supermajority would be required, of 60% or 66% either of votes cast or the entire electorate. Grayling may be making a separate point, that constitutional changes often require legislative supermajorities, but this is not clear from what he's written. It is clear that his claim ("scarcely any civilised state") is false insofar as it refers specifically to referendums, unless he is willing to describe France and Ireland as scarcely civilised. Yet a small minority of actual votes cast, representing 37% of the total electorate, was taken by the politicians in favour of Brexit as not merely justifying but mandating the actions they took following the referendum. There is therefore nowhere near enough justification or legitimacy for a Brexit. Grayling here argues that Brexit is illegitimate. It is not clear what the basis for this is. Grayling may be putting forward the principle that all "constitutional changes comparable in significance should require a supermajority of 60% in a referendum", but it's not clear why we should accept this as a standard for legitimacy. In particular, it's not clear why we should accept this as a standard for legitimacy after the fact. To the best of my knowledge, Grayling did not express any concern about referendum procedures before Remain lost the referendum, or following the very narrow Welsh devolution referendum of 1997. In other words: you can argue that certain types of changes ought only to be considered legitimate if they meet certain requirements, but if you do not apply those requirements universally, then you create the suspicion that you are defining legitimacy in order to make things that you dislike illegitimate. The Brexit ministry empanelled after the referendum sought to trigger Article 50 of the Lisbon Treaty notifying EU partners of an intention to leave the EU, without a parliamentary debate. It had to be taken to court to oblige it to respect the constitutional sovereignty of Parliament. In response, and arguably in contempt both of what is meant to be Parliament’s role and of the intention of the Supreme Court judgment, the government introduced a very short Bill of a few lines to hasten through Parliament, with restricted time to discuss it, and a full threeline whip to ensure that its own MPs, whatever their real views, would vote for triggering Article 50 despite any argument, facts, considerations or warnings that might come up in the hurried debate. What form such legislation should take is entirely a matter for Parliament. But, in the light of a point made in oral argument, it is right to add that the fact that Parliament may decide to content itself with a very brief statute is nothing to the point. There is no equivalence between the constitutional importance of a statute, or any other document, and its length or complexity. A notice under article 50(2) could no doubt be very short indeed, but that would not undermine its momentous significance. It is therefore not even arguable that a short Bill was "in contempt… of the intention of the Supreme Court judgment". As to Parliament's role: Parliament had the opportunity to make amendments. It did not do so. The purport of Briefing Paper 07212 returns to relevance here. It says in section 5 that the referendum is non-binding, advisory, consultative; and section 6 points out that if there were to be any suggestion otherwise, there would need to be a supermajority requirement. something more than a simple plurality of the votes. This does not say that there would need to be a supermajority requirement for a binding referendum. Describing arguments about the need for a supermajority requirement, or describing the practice of other countries which have such requirements, is not the same as claiming that such requirements are needed. In the House of Commons in the debate on the EU Referendum Bill the Minister for Europe, David Lidington, told the House that ‘the legislation is about holding a vote; it makes no provision for what follows. The referendum is advisory’ (Hansard for 16 June 2015). Yet the Brexit ministry has chosen to treat the referendum outcome as binding and mandating, in defiance of the explicit nature of the Referendum Act itself. Let's start in reverse order. The advisory character of the Referendum Act is implicit, not explicit. There is no clause in the Act which says "This referendum shall have advisory force" only. There is just the lack of any clause which says that the referendum shall be legally binding. This is, or should be, clear from Lidington's remarks. I don't think DExEU has ever claimed that the referendum was legally binding. They may have claimed that it was politically binding — that it was the (political) duty of the government to implement the outcome of the referendum. But that's a separate issue. This and the inconsistencies of this referendum with other referenda raise a serious question of constitutional propriety. As I've already noted, the EU referendum followed the past practice of nationwide referendums with respect to the franchise used, and the past practice of all but one UK referendums with respect to the absence of a participation or supermajority requirement. There are no inconsistencies here. As to constitutional propriety: given that the Supreme Court ruled that Parliament had to enable the triggering of Article 50, but that the form in which it did so was up to Parliament, I can't see what form the constitutional impropriety takes — unless Grayling is adding elements to the British constitution on his own initiative. To arrange things as convenient for a given occasion — in effect making them up as one goes along — without any question of conformity to a due process and a propriety of constitutional order, throws the legitimacy of the process into doubt. This applies in a major way to the EU referendum in 2016. These two sentences are deeply ironic. Grayling himself is open to the very same accusation: that his requirements for legitimacy have only come after the referendum, when his preferred outcome lost. Neither he nor anyone else, including the pro-Brexit camp, expected Leave to ‘win’, so he culpably allowed the Brexit faction to arrange the franchise in a way that best suited them — this being the exclusion of sixteen- to seventeen-year-olds (Cameron subsequently said that insisting on their inclusion would have caused too much trouble with his right wing), expatriates, and EU taxpayers in the UK, who between them would have assured a significant Remain majority, a fact the Brexiters well understood. This is a very strange interpretation of the franchise non-decision. The European Union Referendum Bill was sponsored in the House of Commons by Philip Hammond, the then Foreign Secretary, who supported Remain during the referendum. In the House of Lords, it was sponsored by Baroness Anelay, who also supported Remain. When Hammond was not available to defend the bill, it was defended by David Lidington, the Minister of State for Europe. You will, I am sure, be astonished to learn that Lidington too supported Remain. The Bill was not drafted or crafted by a pro-Brexit cabal. To the extent that the Brexit faction within the Conservative party was concerned with procedural matters, it was concerned with different things. As Tim Shipman has written, the Euroskeptics were concerned with question wording, timing, the terms of civil service purdah, the neutrality of the Conservative party as an organisation, and Cabinet agreement to disagree. They did not have to ask for the franchise to be the same as that used for general elections, because that was the default. Thus Cameron agreed with the decision, because he opposed votes for sixteen and seventeen year olds in general. (That same chapter in Shipman’s book also suggests that Grayling is wrong about the impact of enfranchisement of sixteen and seventeen year olds. If 16 and 17 year olds turned out at a rate of 75%, and voted 70% in favour of Remain, this would have led to a net gain of 650,000 votes for Remain, some way short of the margin of victory of 1.27 million. I’ve written about the effects of enfranchising EU citizens here). Cameron almost certainly would have been criticised by the Brexit faction within the Conservative party, for a very good reason which should have been obvious to Grayling: Brexiteers would have regarded the departure from the status quo as an attempt to make a Remain victory more likely. 16 and 17 year olds were known to be more pro-Remain, as were EU citizens resident in the UK. Thus, had the franchise been as Grayling suggests it ought to have been, the Brexit faction would have had grounds to accuse Cameron of rigging the franchise. These grounds are, in my view, very much stronger than Grayling's argument that the government manipulated the franchise. After all, the government sought a Remain win. Grayling is accusing the government of manipulating the franchise to make it harder for itself. Here we get to the name-calling section. There are several points to make here. The first point is a definitional one. Strictly, gerrymandering concerns the drawing of geographic boundaries used in elections, rather than decisions about the franchise. But if we are prepared to understand gerrymandering in a broader sense so as to include restrictions of the franchise as well as (geographic) divisions of those so enfranchised, then "deliberate restriction" still isn't enough. There needs to be the intent to procure an advantage. That's lacking here. A majority of the cabinet wanted to Remain. It makes no sense to accuse them of gerrymandering if the effect of their actions was to disadvantage the outcome they preferred. The second point is a terminological one: this was not a restriction of the franchise, but the adoption of the franchise already in use for nationwide referendums. You can argue that, by failing to pass amendments giving rights to these citizens, Parliament acted — but accusing people of gerrymandering by omission is a novel argument. Third, and as a consequence, it doesn't make sense to talk of this as a deliberate restriction. It was entirely reasonable to adopt the Westminster franchise for both principled and practical grounds. The Electoral Commission had noted that the use of alternative franchises would require more work on the part of returning officers. The changes that were made to the Westminster franchise (regarding Gibraltar and peers) were de minimis. If after having read this, you still believe that Grayling is right, ask yourself: if you had supported Leave, and the government had proposed changing the franchise in the way Grayling suggests, would not that have been closer to gerrymandering than the process described here? I've now spent three times as many words fisking Grayling as Grayling spent in his extract. I think it's important to do this to show how his arguments are based on gross errors and misrepresentations; because I think academics (including Grayling) ought to be held to high standards regarding accuracy; and because I don't want people who supported Remain to be tarnished by association with bad losers like Grayling. There are reasonable arguments as to why we are not politically or morally obliged to exit the EU, and may even be obliged to oppose Brexit. Albert Weale's argument is the best of these. I disagree with these arguments, but they (or at least the better ones) accept that the referendum had normative force. They don't try to engage in name-calling, and accuse the government of gerrymandering — still less engaging in a coup. (1) I said that the UK and Portugal were the only two EU countries to allow some foreign nationals to vote in national elections. This is wrong: Ireland allows British citizens the vote in national legislative elections, but not in presidential elections or in referendums. I can't remember who pointed this out to me: thank you in any event. 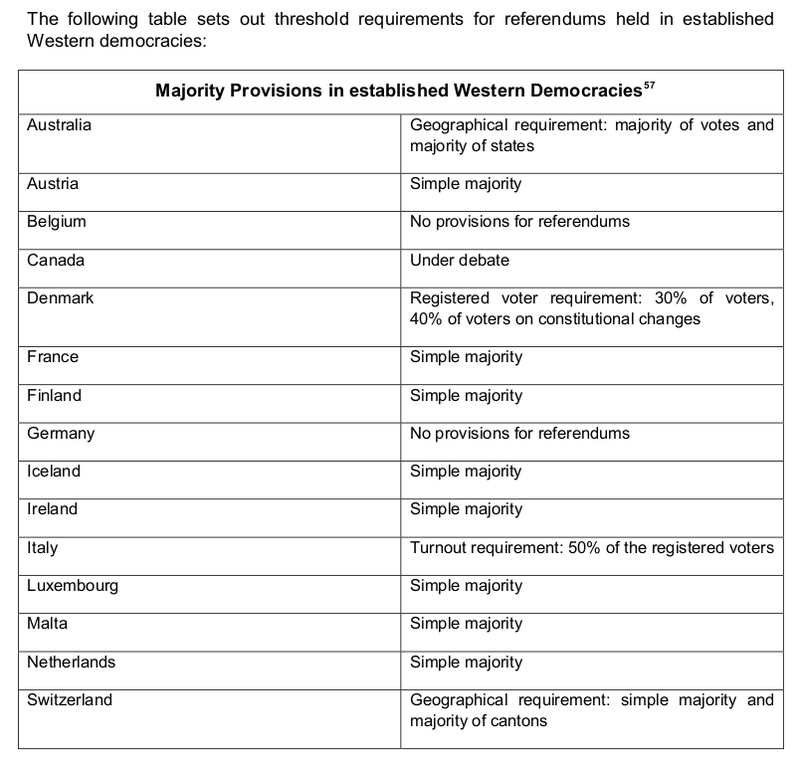 (2) The table from the House of Commons Library is slightly misleading: the turnout requirement in Italy applies only to abrogative referendums, and not to constitutional referendums; the threshold requirements in Switzerland apply only to initiatives and constitutional changes, not referendums on ordinary legislation; and since 2011 referendums in the Netherlands have required a turnout of at least 30% in order to be valid. My thanks to Davide Denti, Alexandre Afonso and Leontine Loeber for pointing these out.